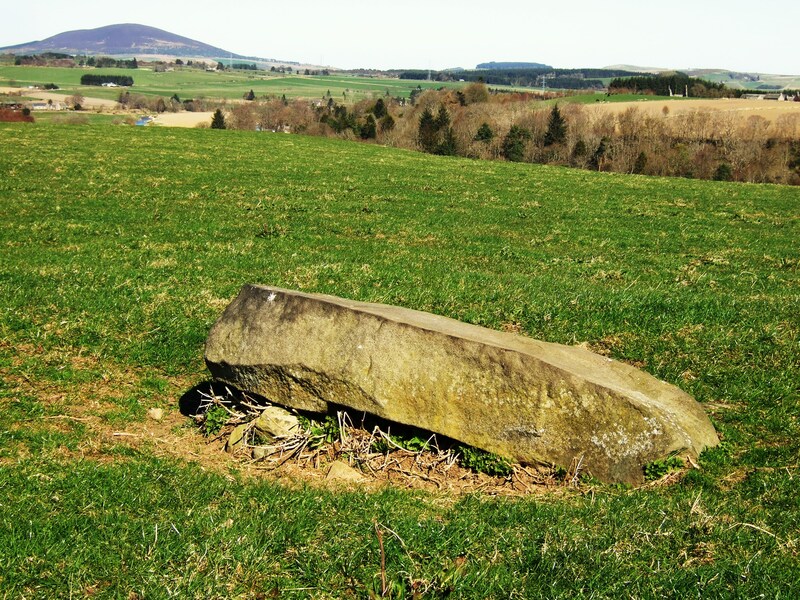 Loanhead of Daviot bronze age recumbent stone circle lies a few miles from Inverurie and is a true circle. I’m very fond of this circle having come upon it early one misty morning with its stones looming up in the sun-infused vapour giving it an other-worldly appearance. 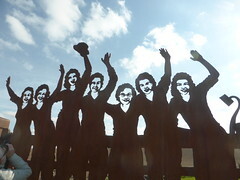 I’ve been back several times, including December in 2011 when these photographs were taken. Clearly this circle from has been reconstructed. 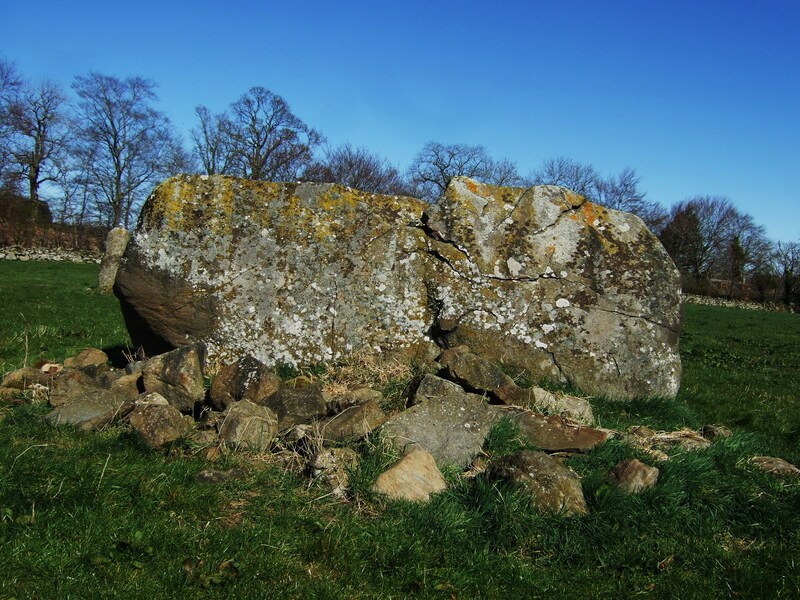 It is well kept with its cleared kerb cairn in the interior which contained pottery fragments and human remains. 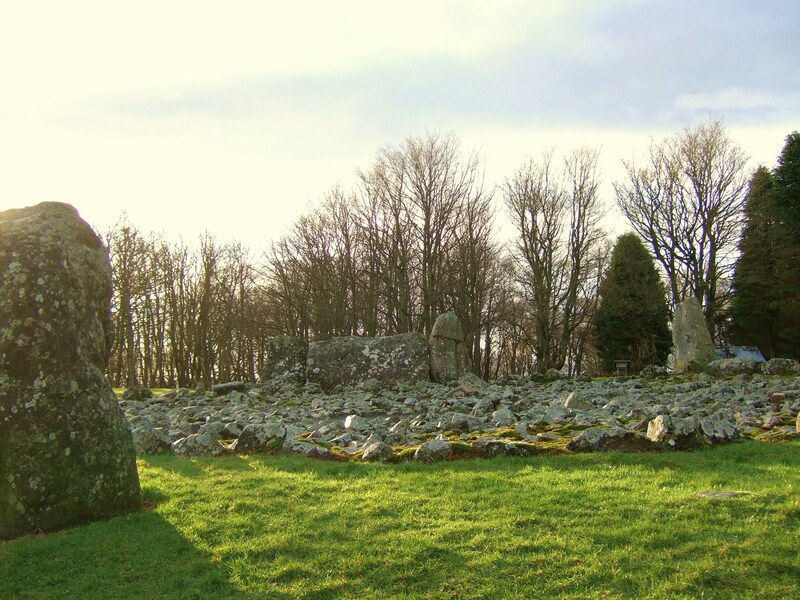 Recumbent stone circles are a feature of the area close to Aberdeen, especially around Insch/Bennachie/Alford. 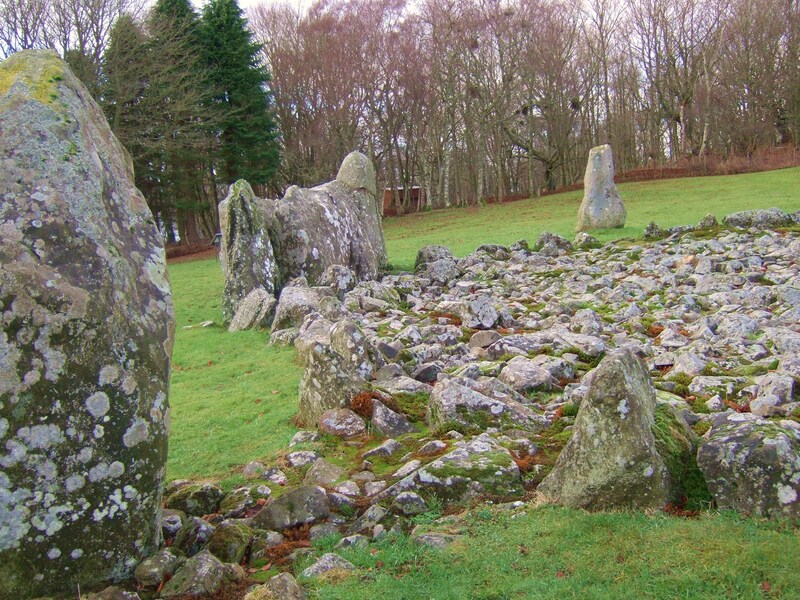 There is much speculation about the uses recumbent circles were put to but over the thousands of years of their existence it is fairly certain that people used them differently over time for ceremonies, cremations and interments. 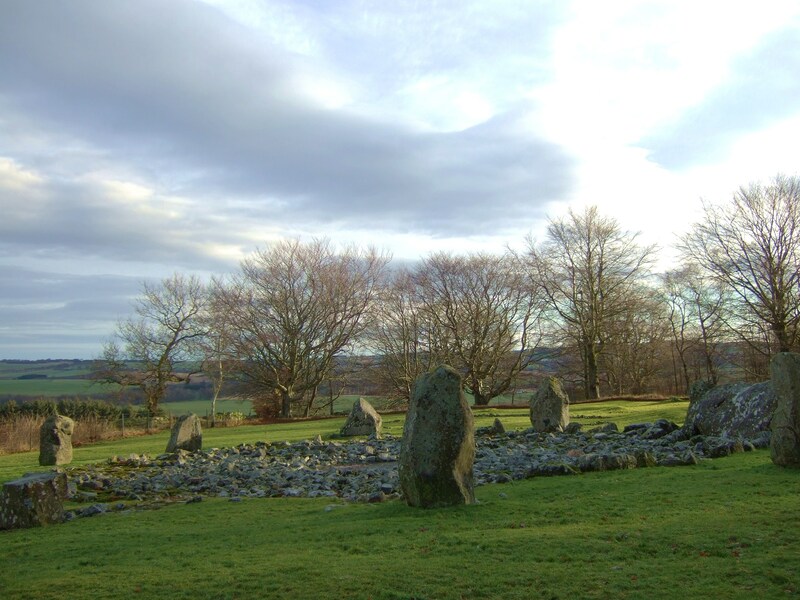 Ten stones form this large circle of around 20 metres and each stone stands in its own cairn. The recumbent is actually broken in two and faces SSW. 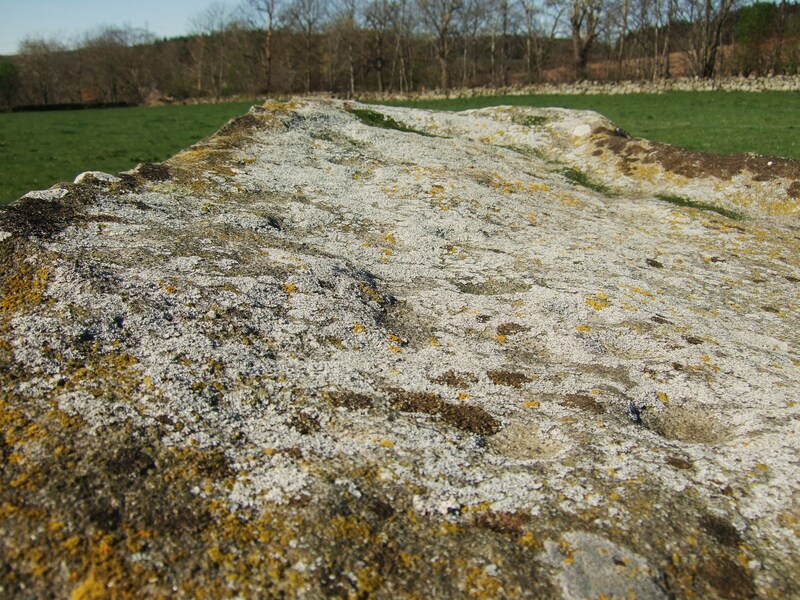 Remnants of Neolithic pottery were discovered here and cremated human remains. 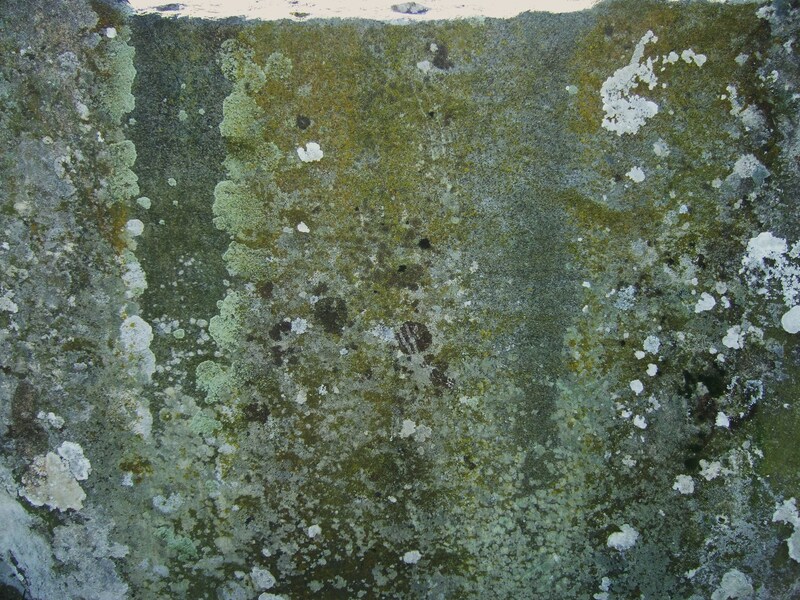 One of the standing stones has been cupmarked. 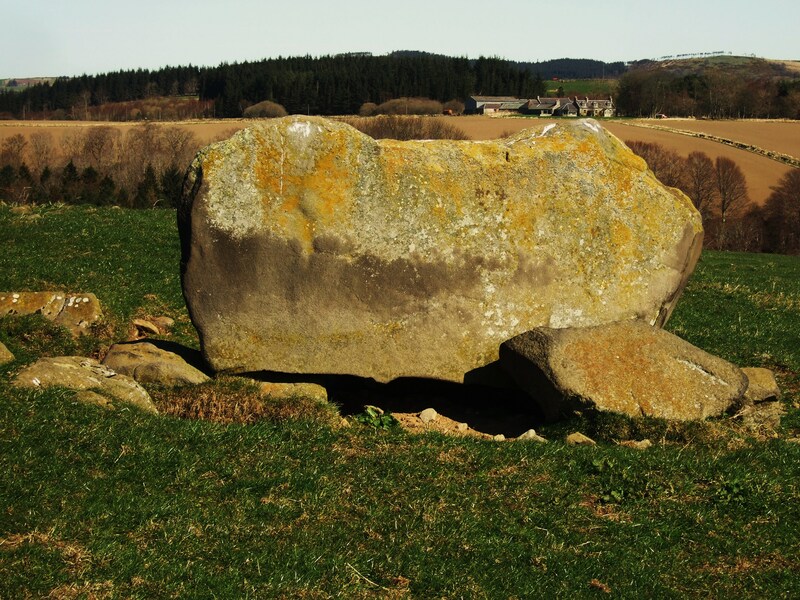 Daviot stones feature shaped bases into beak shapes to give better seating in the earth. 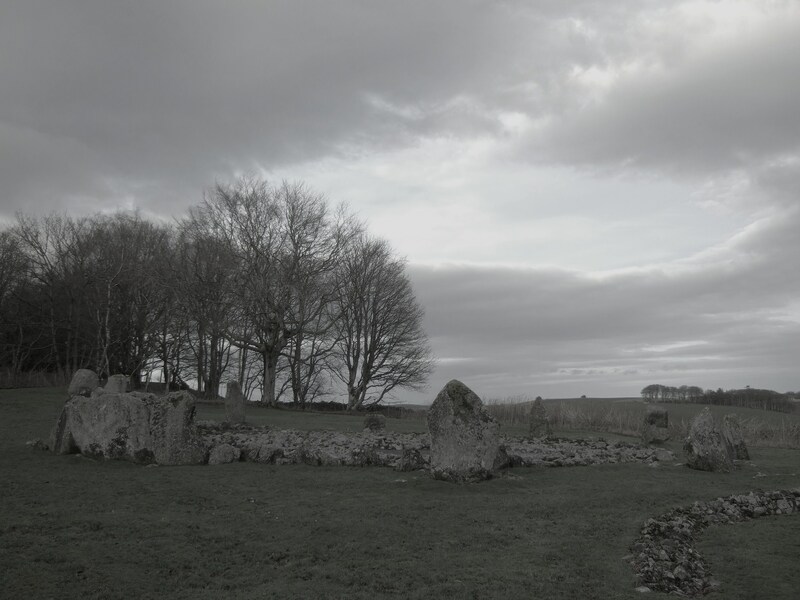 The second rung alongside the recumbent circle is thought to have been the site of later cremations. 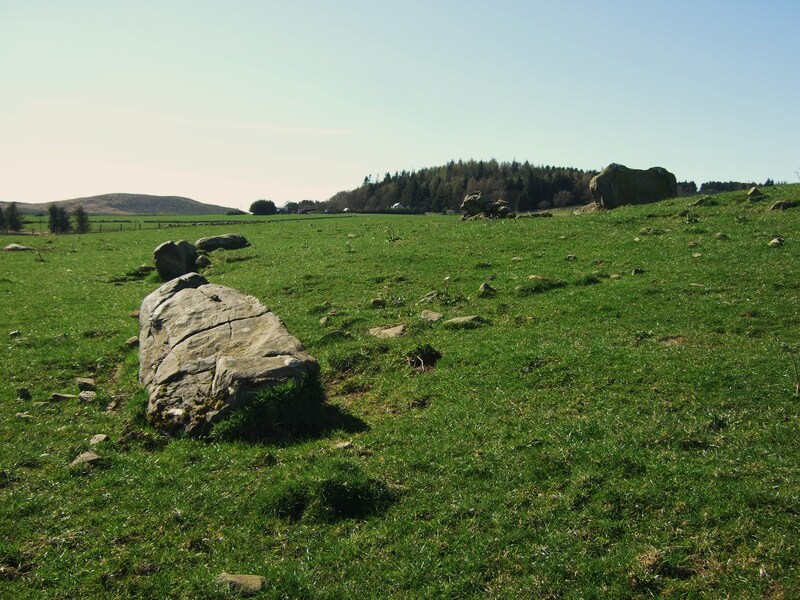 The recumbent stone circle at Rothiemay in Banffshire is easily accessible thanks to a very accommodating farmer. And it is signposted. 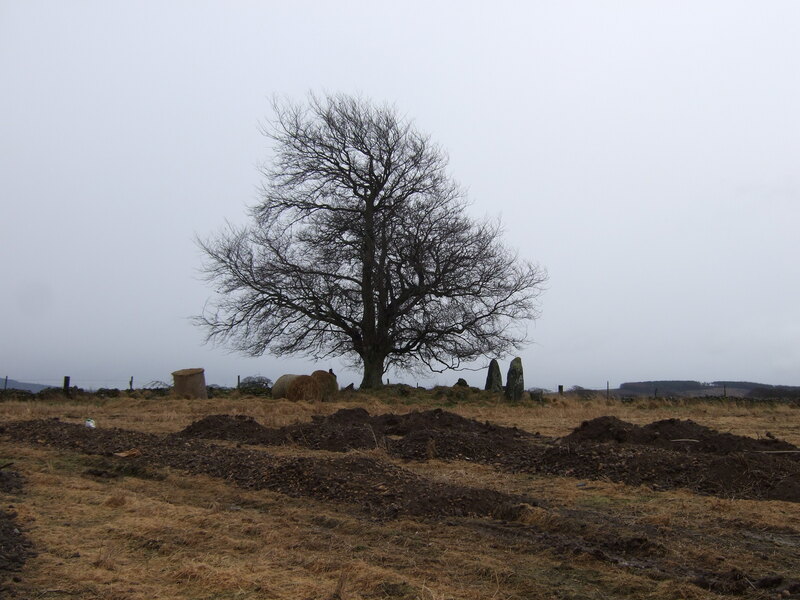 This grey igneous circle is incomplete however, having been disturbed in the early 19th century forty years before the introduction of preservation orders through the Ancient Monuments Act (1882) and the whole saved from complete destruction by the landowner. Thankfully the recumbent is still there along with four uprights. It has been proposed that originally there were two concentric circles: outer and inner. 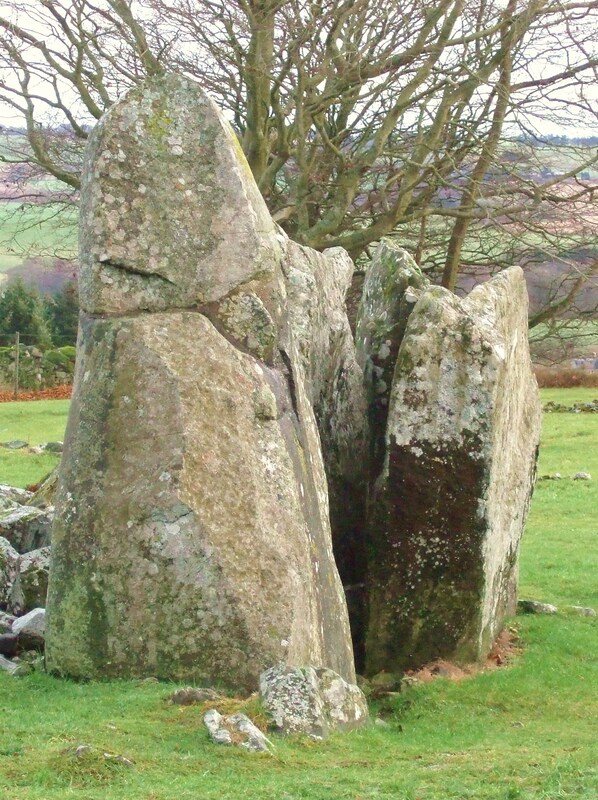 The circle, as is, points to an asymmetrical shape with the recumbent’s position creating this irregularity. 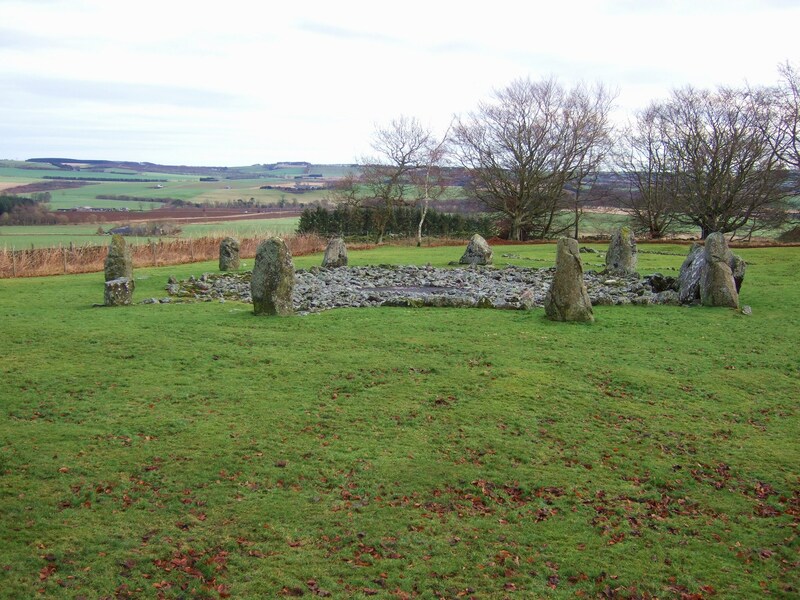 This Rothiemay circle is one of the most important in the northeast for its cup marks; they are numerous – in excess of 100, some ringed – on the recumbent and especially grouped at the point of the rising or setting major standstill moon and the are some of the largest found. 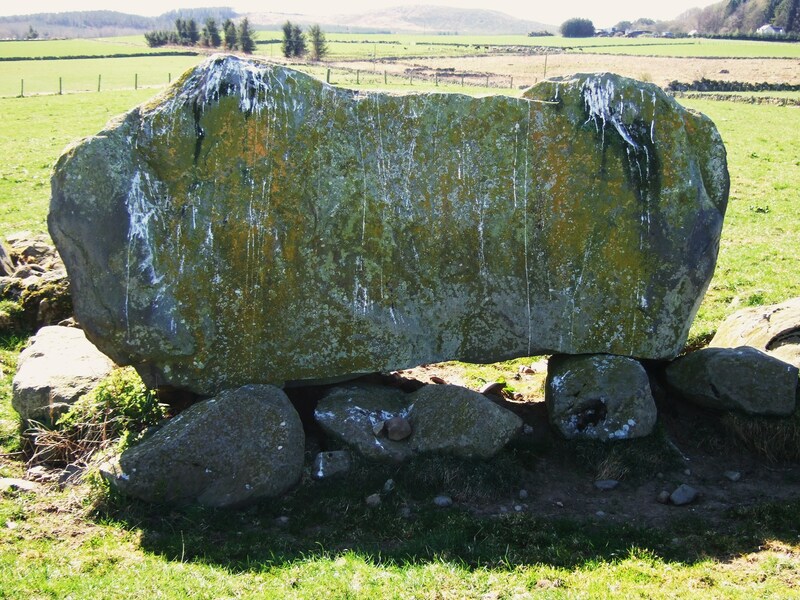 The clustered cup marks on this recumbent have been linked to star patterns. 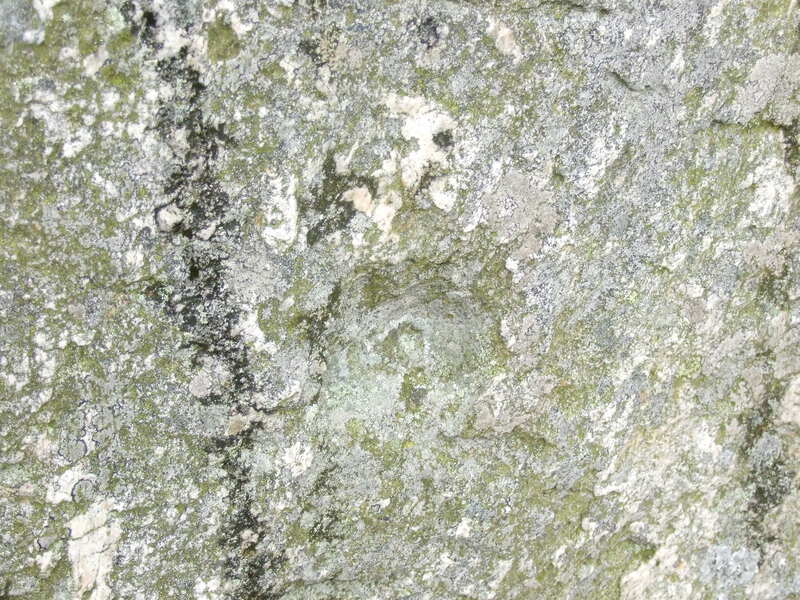 Other cup marks are documented on the stone to the east of the recumbent. 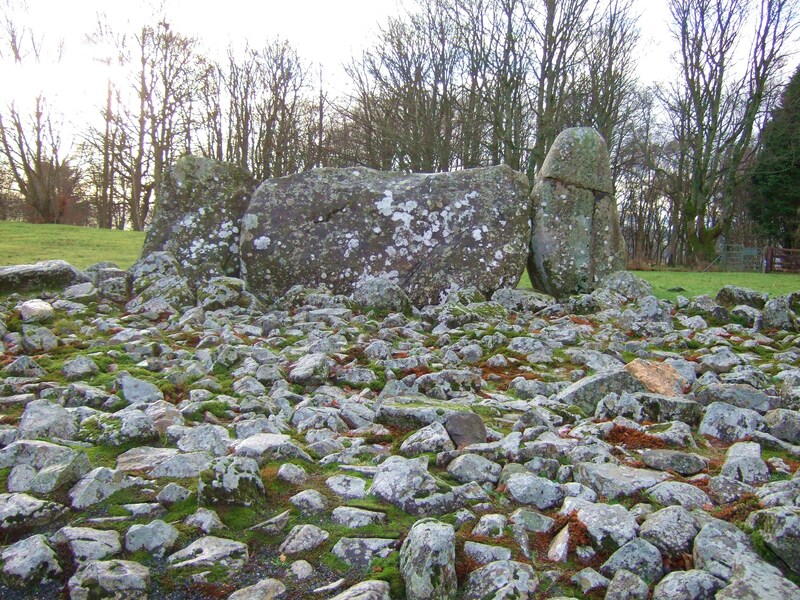 The recumbent measures 4 metres long by almost 2 metres high and faces the SW to capture the southern full moon at the major standstill. The recumbent weighs around 20 tons. The orthostats are around 2m proud of the ground. The circle looks larger than many others I’ve seen: around 33 metres. This may be due to it being a concentric circle like Auchquhorthies. 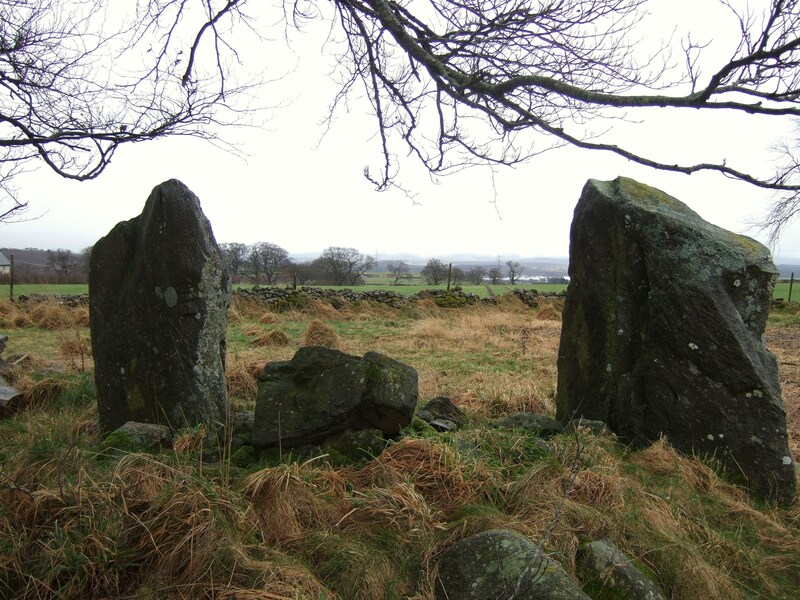 Some believe that recumbent stones were worked to mirror or frame, by its flankers, the hills lying off on the horizon. 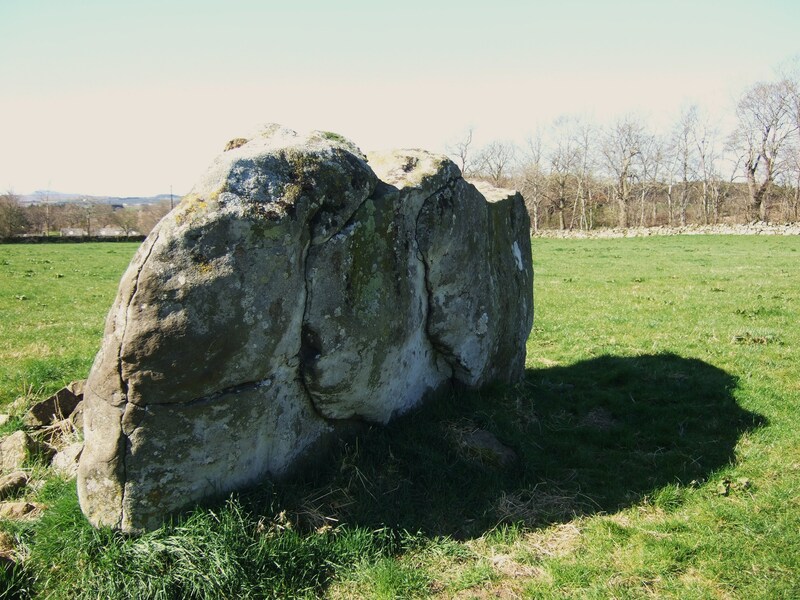 Rothiemay’s recumbent is thought to be one such example looking as it does towards Hillhead of Avochie (‘v’ is not usually pronounced in Scotland in place names derived from the Gaelic [pronounced Gaallic as opposed to Irish Gaylic]). 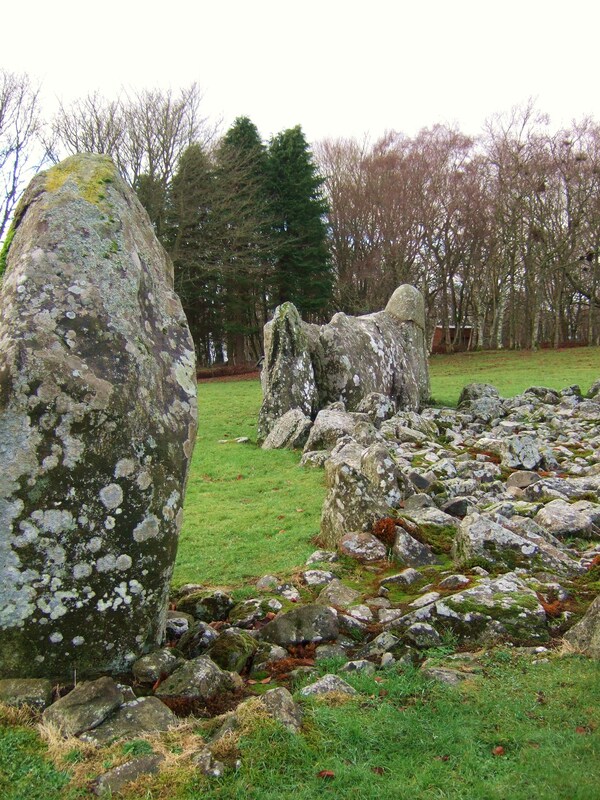 There is a tenuous link with Rothiemay recumbent stone circle and John Foster Forbes who had been born at Rothiemay Castle and who propounded some strange ideas. Far from being Bronze Age constructions he imagined they dated to around 8000 BC when priests migrated to these islands from the lost city of Atlantis. Preoccupation with the occult was strong in the 1930s. Some Nazis used occultism to try to prove the existence of a superior Nordic race originating from the North Pole. 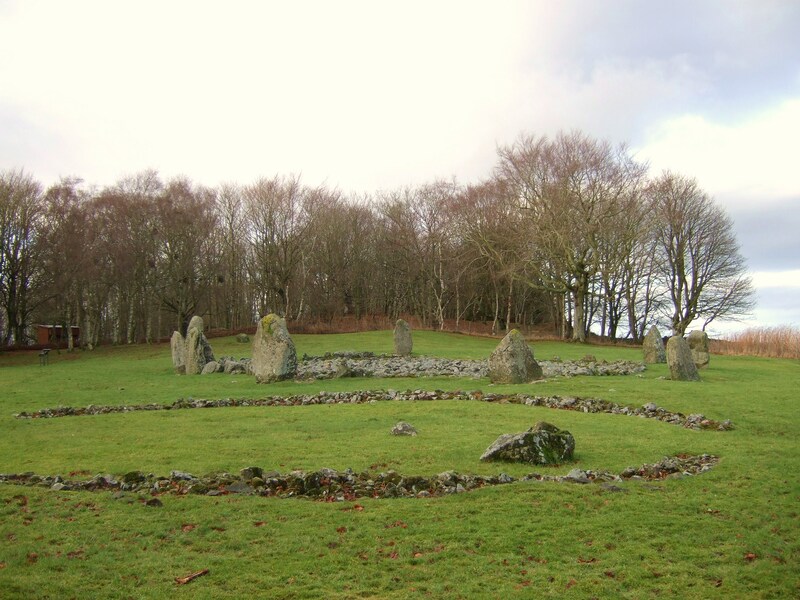 Forbes was influenced by psychometrics and his eccentric explanations about stone circles come through association with the psychic Iris Campbell. 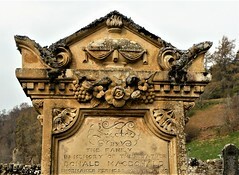 This once military intelligence officer, Forbes also linked ancient sites such as stone circles to the return of extraterrestrials and was prominent in the upsurge of interest in UFOs in Britain after WWII. The remains of this circle took a little bit of finding although once detected it’s hard to see why. However when I first thought I’d spotted it my companion dismissed it as a sheep on the brow of the hill. I wouldn’t like to meet that sheep on a dark night. 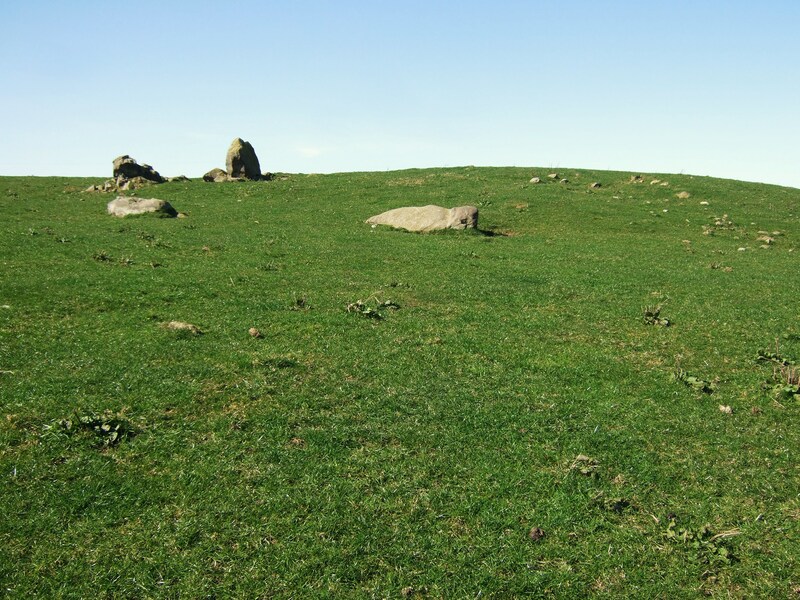 The hill is in fact an artificial mound and set within a field. 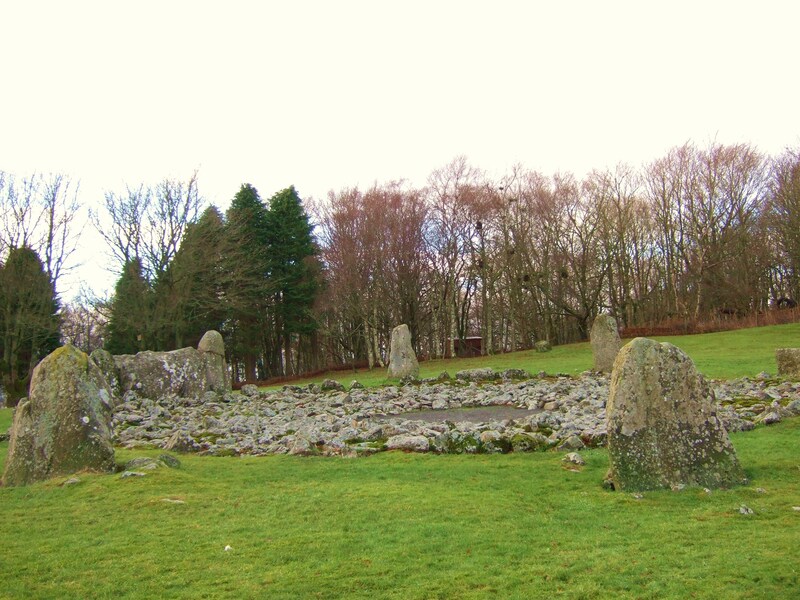 Little of the recumbent circle remains but some disturbed stones lie around the area. 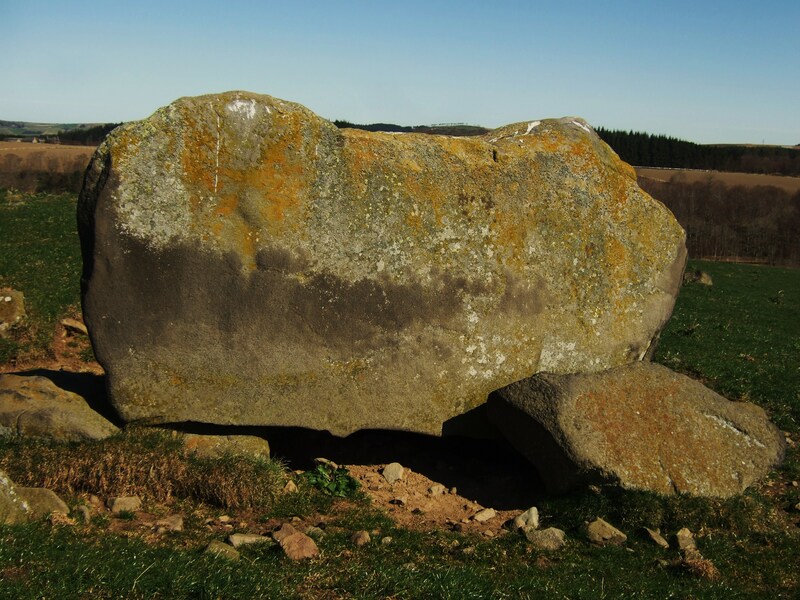 The recumbent is magnificent and is still in its place set up on group of small boulders and faces SSW. Was it raised at some point? The Ringing Stone it is also known as the Iron Stone . 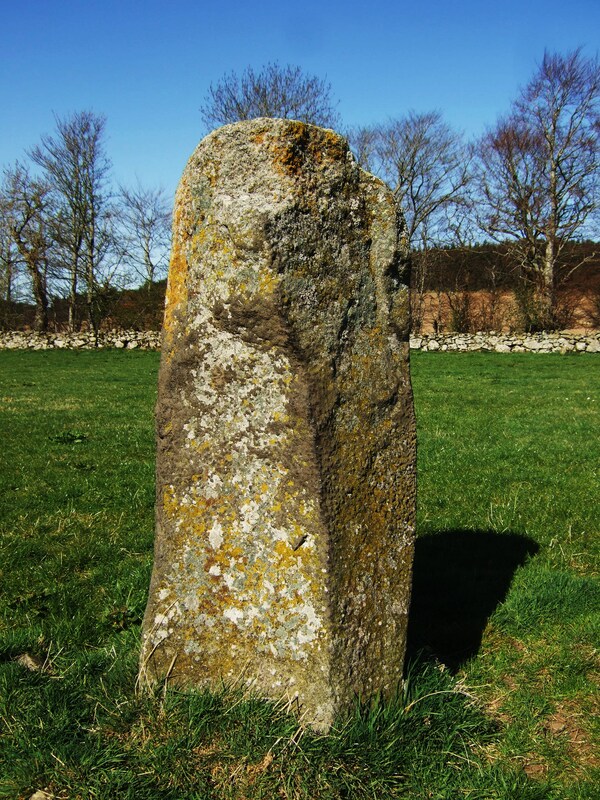 The Ringing Stone gets its name from the ringing sound given off when it is tapped. The muckle recumbent measures in excess of 10 feet long so comes in at well beyond even the most magnificent of sheep. 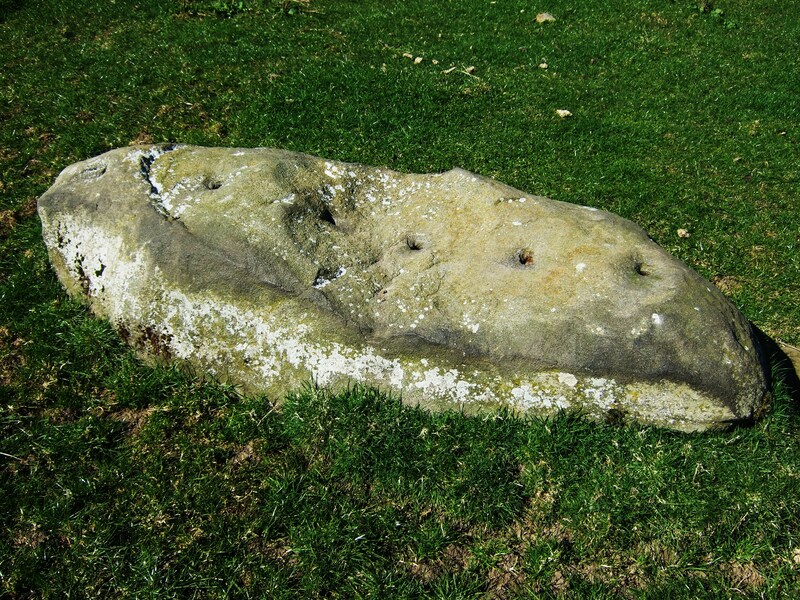 The far fallen stone is whinstone measuring around 6 ft X almost 3ft. 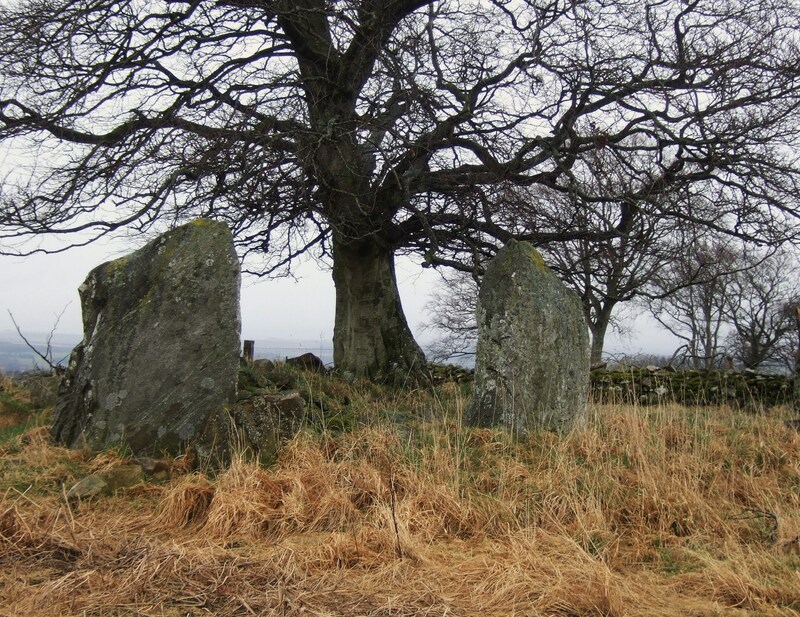 Over the centuries since the period of stone circles people have demolished them and reused their stones. This appears to have happened here with the ring’s missing orthostats. The recumbent’s survival might be due to it being left as a rubbing stone for farm beasts. 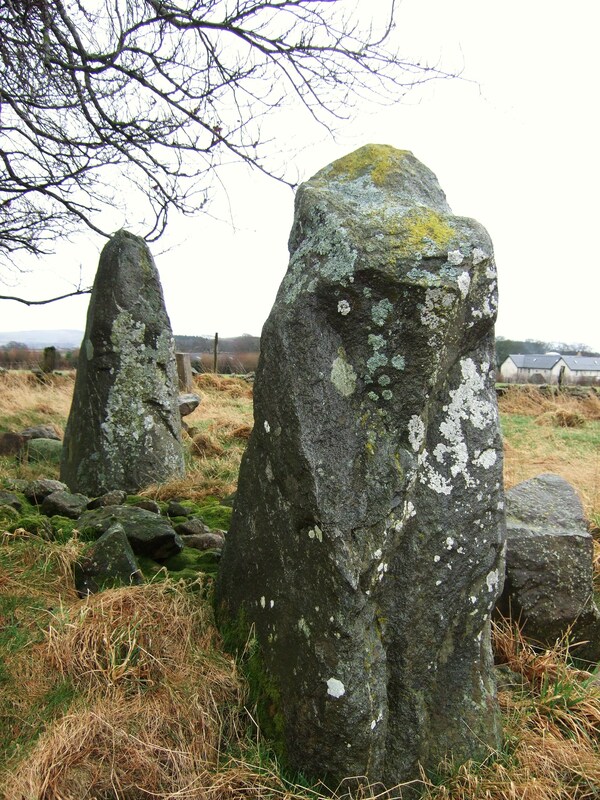 There is also evidence that stones have been drilled into with the intention of splitting them. 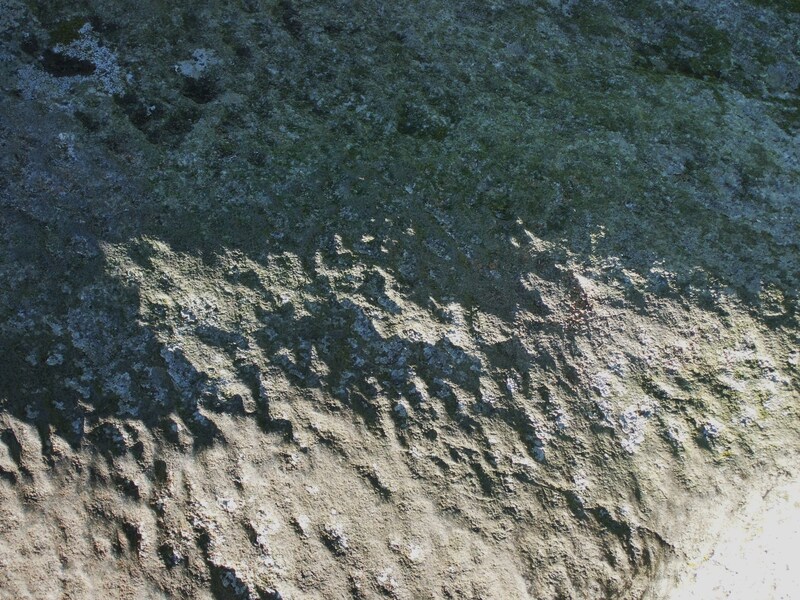 Some of the large debris stones are similarly drilled in the field below. 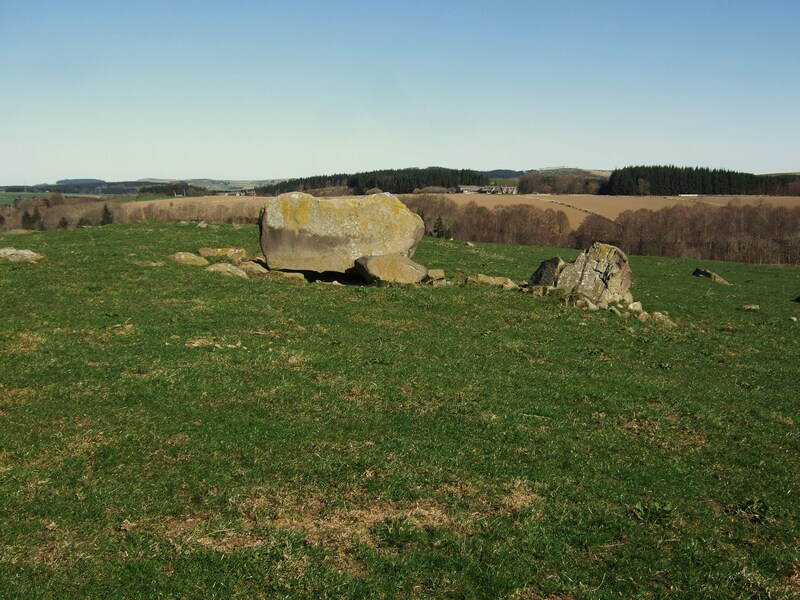 Continuing the exploration of Aberdeenshire’s many stone circles and recumbent circles in particular took us to South Fornet, close to Castle Fraser. 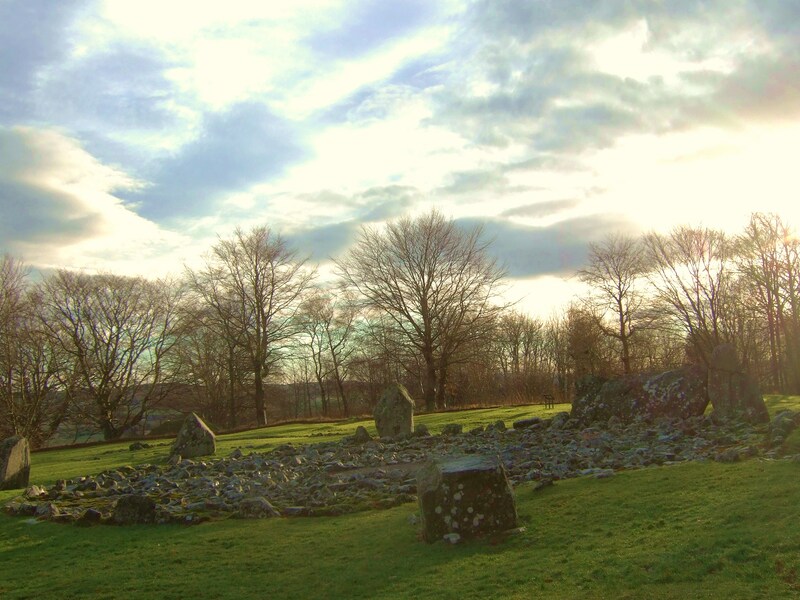 It’s not particularly easy to find some of the remaining recumbent stone circles which once abounded in the northeast of Scotland. 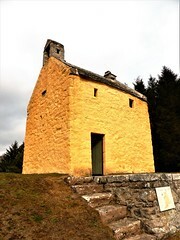 Several have been raided over time for their stone, perhaps for building or land rollers. Some have been cleared during the great land reclamations of the agricultural revolution. 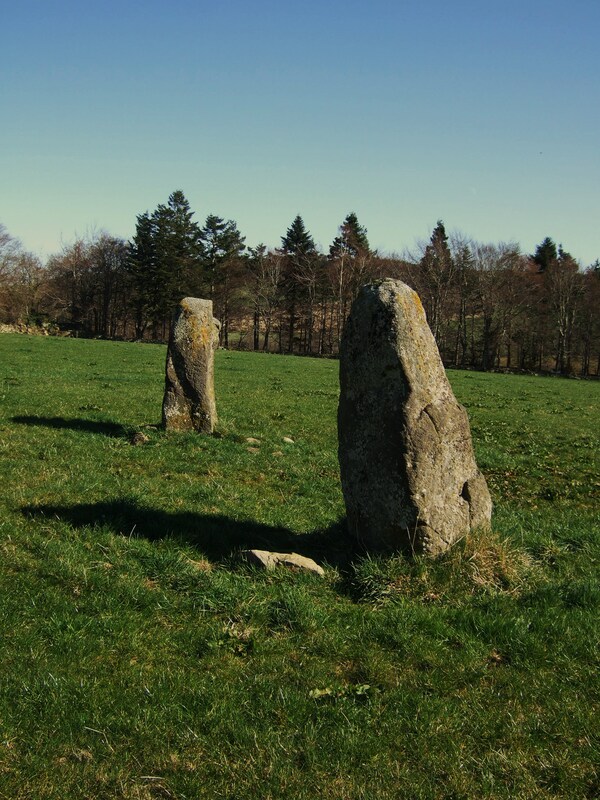 This remaining stones from this circle were not obvious from the road and required walking along the edge of a field. It’s not an easy way in as the ground is very uneven and the way is difficult. 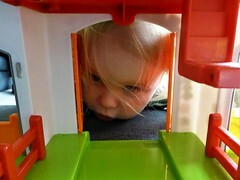 Then there are fences to be crossed. 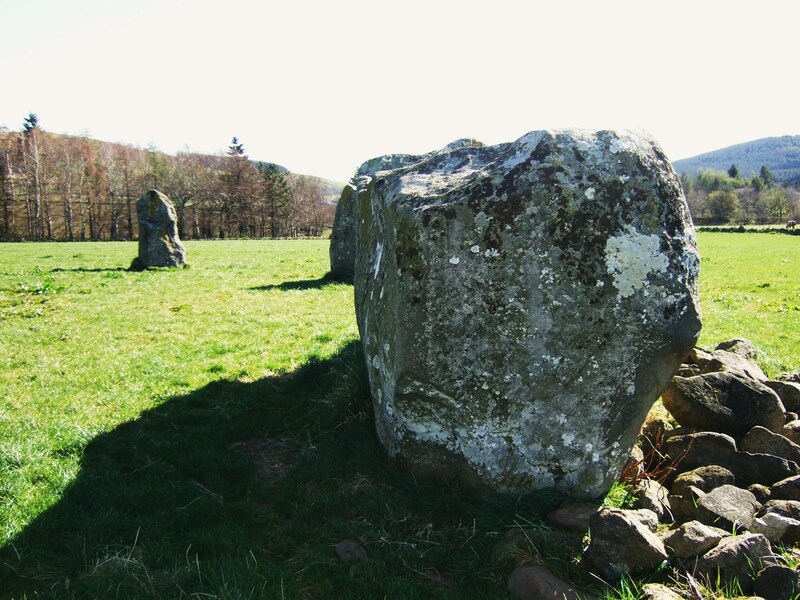 It is interesting how some farmers, clearly proud to be working land which includes these wonderful monuments, encourage visitors to access their stone circles while others make life difficult for anyone wishing to access them. 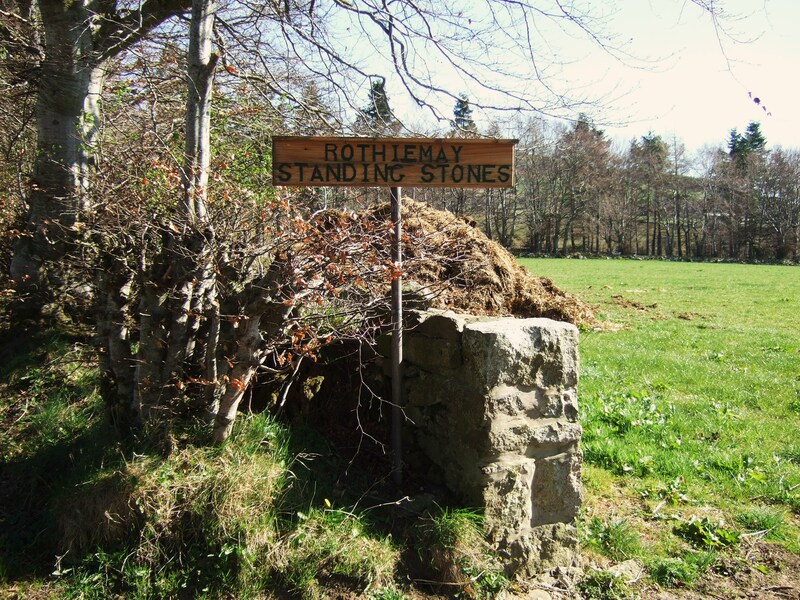 The stones stand well above 6 feet high. 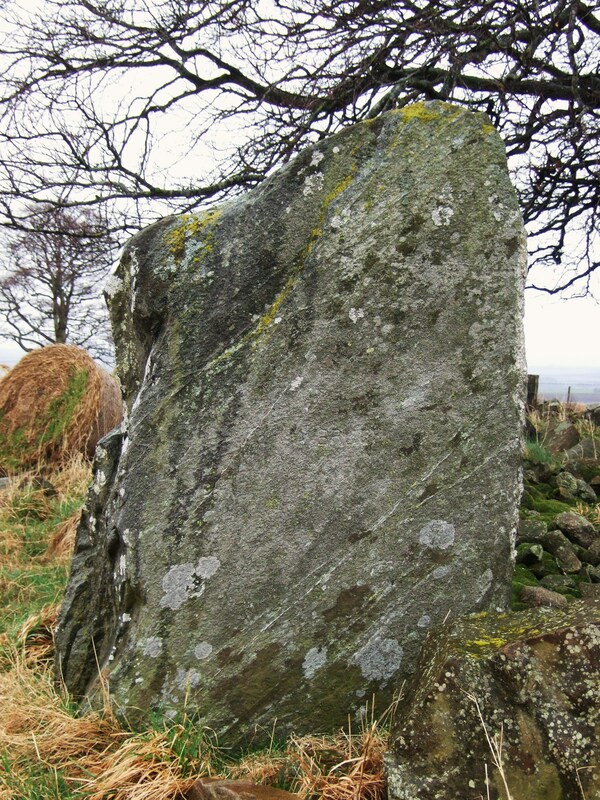 There is a lot of similarity in the shape of these grey whinstone flankers: pointing in towards the missing recumbent. Veins of white quartz can be seen running through the flankers. South Fornet is set in beautiful open countryside and only the two flankers remain upright. 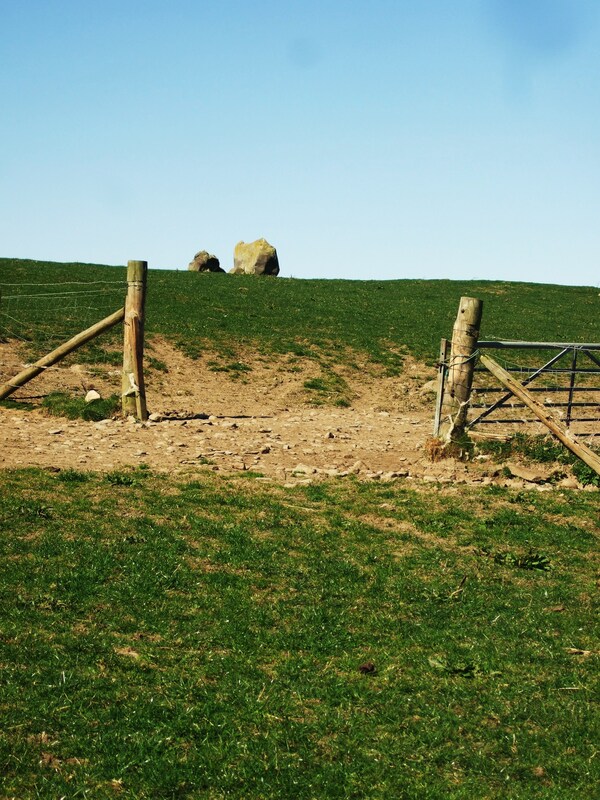 The gap where the recumbent would have been has been in-filled with field rubble. 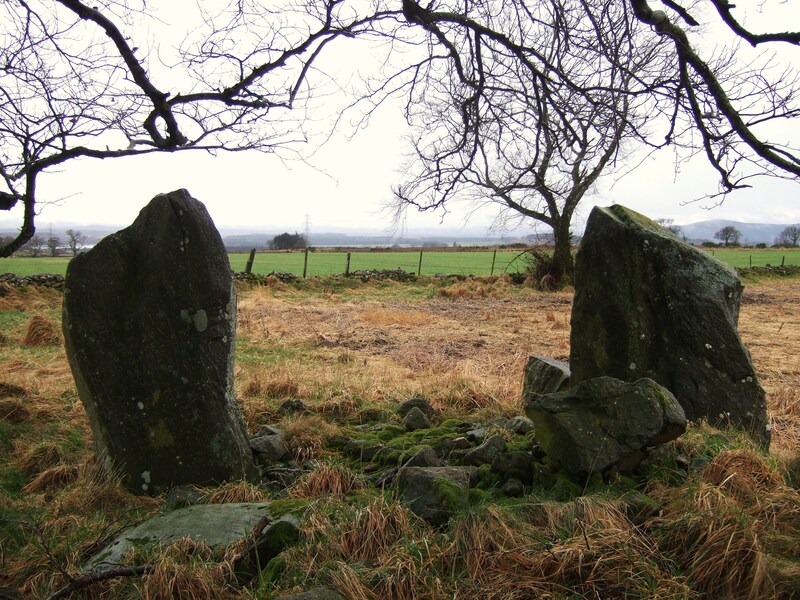 Two stones, apparently from the circle lie where they fell or were abandoned on removal. 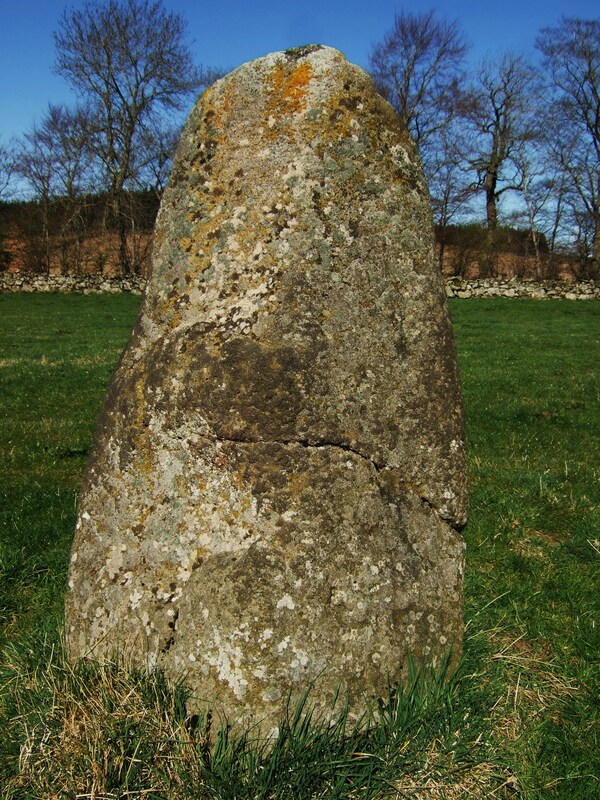 Cup marks are visible cut into the stones, not necessarily from the time the circle was erected. 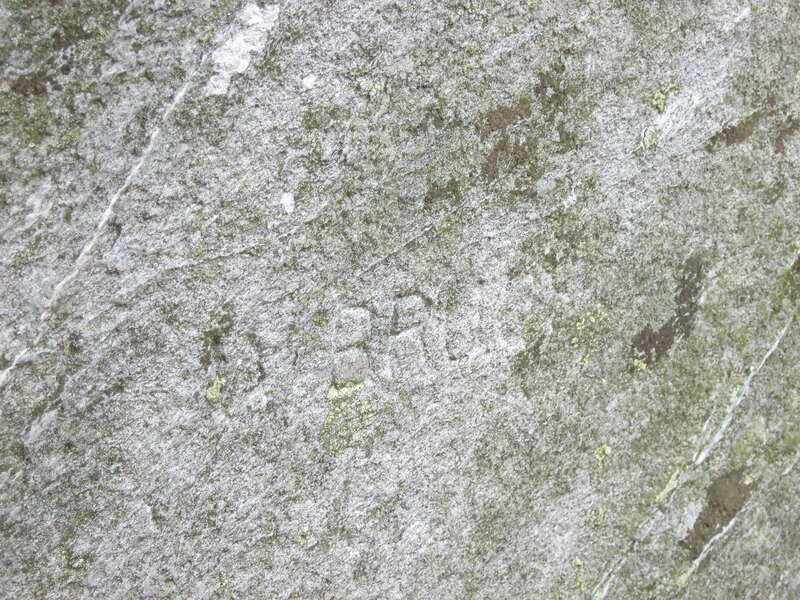 At some point in its history, the name A Bruce has been carved into one of the stones.